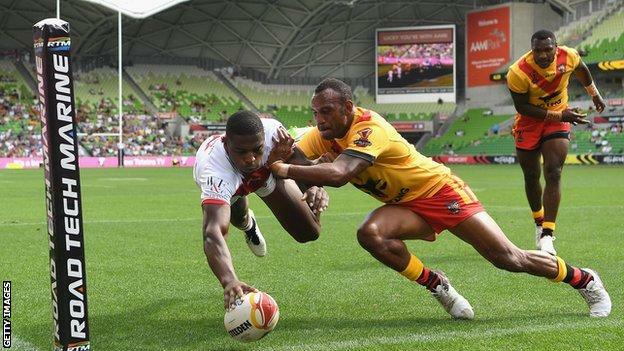 England beat Papua New Guinea to set up a World Cup semi-final against Tonga despite an error-strewn performance. England built a healthy half-time lead after a double from winger Jermaine McGillvary and Alex Walmsley’s score. Ben Currie crossed after the break as Garry Lo got PNG on the board, but two tries from Kallum Watkins and a late try from Ryan Hall sealed the victory. But the winning margin masked a 56% completion rate and an error count of 20 from Wayne Bennett’s side. McGillvary was one of the bright points in Melbourne – the 29-year-old crossed for two almost identical scores as England found space down the right, taking his tally to six tries for the tournament. 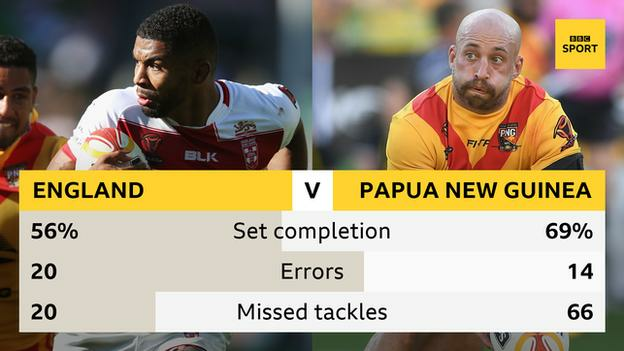 Kato Ottio had PNG’s best chance of the first half but was denied on the hooter for a push on England’s Gareth Widdop. The full-back, who was commanding at the back, then slipped through a delightful kick which was collected by Currie as England extended their lead in the second period. When PNG scored through Castleford Tigers-bound Lo, a nervous wave rippled through the stadium, but McGillvary turned provider to set up centre Watkins before his diving effort and Hall’s finish out wide brought up seven tries for England. Despite the flattering scoreline, coach Bennett is still waiting for an 80-minute performance from his side. England’s inconsistency in attack has been a theme of the tournament, with wins against Lebanon and France in the group stage overshadowed by periods of sloppy play. Against the French they made 13 handling errors, and managed 12 in the first half alone against PNG. England half-back Luke Gale should have opened the scoring after two minutes when captain Sean O’Loughlin popped out a delicious offload in the tackle, but he failed to offload to the two men outside him. A host of loose carries and spilled ball from forwards Sam Burgess and Chris Hill added to the error count, which increased further after the break. James Graham carved open the PNG defence but a forward pass from interchange James Roby squandered another attacking set. That was a rare mistake from Roby who otherwise put in a controlled performance from the bench and will be pushing for a starting berth ahead of Josh Hodgson against Tonga next weekend. And Bennett will also be keen to see how stand-off Kevin Brown is after he appeared to be briefly knocked out during the first half – an incident that led to his withdrawal at the break. McGillvary has caused quite a storm in Australia. The 29-year-old former warehouse worker has had a remarkable rise in the sport after packing in his job when he was persuaded to join the Huddersfield academy by his cousin, club captain Leroy Cudjoe. England’s player of the tournament so far, his World Cup looked to be in doubt when he was alleged to have bitten Lebanon captain Robbie Farah during the group game in Sydney. However, he was cleared and went on to score two tries in England’s final pool match against France. Another clinical performance followed against Papua New Guinea, and he has now scored 11 tries in his past 10 games. He has also made more metres than any other player in the tournament. Former England international Jon Wilkin told BBC Sport: “He’s the best winger, for me, in the world at the moment. Widdop was another highlight for Bennett’s side and despite having few chances to stretch his legs in attack, he was in control at the back, making several telling tackles. The St George Illawarra Dragon covered all of PNG’s testing grubbers, including anticipating a bounce off the posts and dominating the aerial battle. With Jonny Lomax now fit after returning from injury, Bennett will have a few selection headaches for the semi-final. The Kumuls have been one of the most entertaining sides of the tournament. They were unbeaten in the group stages, scoring 24 tries in their opening three matches and conceding just two in reply. But against England they were rocked by an early injury to influential captain David Mead who looked to have been knocked out while tackling Gale and was unable to return to the field. Playing outside of PNG capital city Port Moresby for the first time in the tournament, they were unable to unleash their attacking potential against a well-drilled England defence. 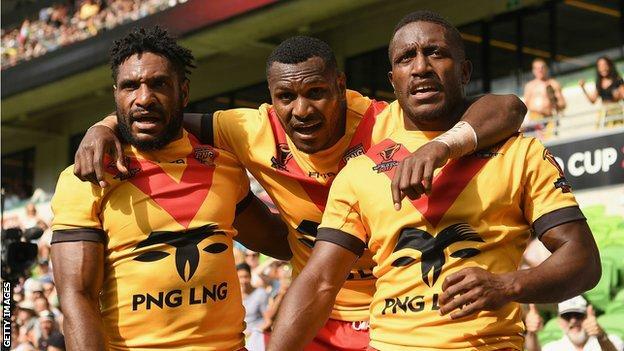 They were denied a try at the death for crossing but for the country where rugby league is practically a religion, their impressive run to the quarters will have further fuelled their obsession. England: Widdop; McGillvary, Watkins, Bateman, Hall; Brown, Gale; Hill, Hodgson, Graham, S Burgess, Whitehead, O’Loughlin (capt). Interchange: Walmsley, T Burgess, Currie, Roby. Papua New Guinea: Mead (capt); Olam, Ottio, Macdonald, Lo; A Boas, W Boas; Meninga, Segeyaro, Page, Martin, Minoga, Aiton. Interchange: Baptiste, Amean, Albert, Griffin.